The price of serving Thanksgiving dinner for 10 people hovers around $50. Depending on the size of your group, it could cost even more. It is always wise to search for ways to trim the cost of your meal. Some people have decided to do that by holding potluck dinners for the holiday. Others search for low-cost or free food items to put on their table. Here’s where you can find a free turkey this year! Sometimes the dollar amount to get your turkey free is a bit high (like $100) though so you may be better off simply paying for the bird and your sides. However, if you’re already planning on doing your grocery shopping that week, you may be able to score a free turkey by spending the cash you’d normally spend anyway. If you aren’t planning on spending $100 on groceries any time soon, you may consider offering to do your friends’ shopping for them. During this time of year, many people would appreciate not having to go into the stores themselves, and you can keep the free turkey as your “payment” for running their errands. You can also decrease the total amount required to get a free turkey by using coupons. Generally, the amount to trigger your freebie is calculated prior to any coupons being applied. It is important to note that many of these promotions have rules. Most of them will exclude gift cards and alcohol from qualifying purchases to get your turkey free. BOGO turkeys are another popular promotion at this time of year. Sometimes it is to buy one turkey, get one free. Other times it may require you to buy another type of food. For instance, some stores may have a buy one ham, get a turkey free. This is a great way to prep for your Christmas dinner a month or more ahead of time while also trimming the cost of your Thanksgiving meal. The same idea from above applies here as well. If you have friends or family that need help getting their shopping done, you can keep a free turkey for yourself! Places like Target have begun to roll out food sections in recent years. 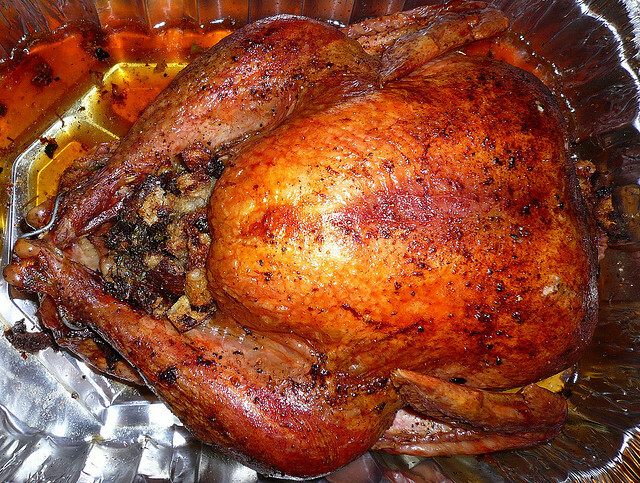 Sometimes this can be a great place to find a free or low-cost turkey. Most of the time, these stores compete with grocers by offer free turkey promotions. To find out if a store near you has this, check out the local newspaper advertisements in the weeks leading up to Thanksgiving. Depending on your location, there may be a few ways to win a free turkey too. Listen for local radio call-in contests and local news contests. You can also check the local newspaper and any community bulletins for additional opportunities. If you are motivated, you can discover a number of ways to score a free bird this Thanksgiving. Before you throw away your junk mail, flip through and see if there are any free turkey promotions hiding in there. For instance, a local car dealer may be giving away free turkeys to people who come down to test drive a vehicle (how easy is that?). If you’re short on money but have something of value lying around the house, you may be able to trade the item on Craigslist for a Thanksgiving turkey. 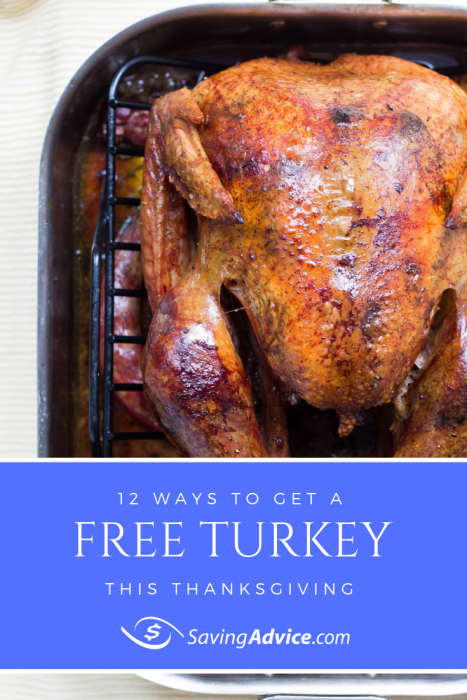 Although this isn’t completely “free,” you won’t have to spend a dime on your turkey. Catalina coupons are typically printed out at checkout or sit by the cash register for customers. Some of these may offer a certain dollar amount off your entire purchase. If you are able to find one to cover the purchase of a turkey, it is an easy way to get it for free. Keep an eye out for this kind of coupon throughout the year and you can get a few hundred dollars worth of food for free. If you don’t see them by the checkout, you can also check empty carts and trash cans near the checkout. Many people toss these coupons out without a second thought. Not everyone is able to make the purchases necessary to get a free turkey. If you simply can’t afford one, there are a number of options available to you to get a Thanksgiving meal on the table at no cost to you. Almost all local food banks will have turkeys to give away for the holidays. Many grocery stores offer the option to donate your second turkey from BOGO sales to charity. Because most people don’t need two turkeys, it benefits food banks greatly. Grocers are also known to donate their excess turkeys to food banks after Thanksgiving as well. United Way is a fantastic organization that will be able to connect you with a partner to help you get a free turkey. This organization has connections in every community that can assist you with your Thanksgiving meal and just about any other social service you may need. Craigslist was mentioned above as a way to get a free turkey by trading items for the food. However, you can also make a request on these sites. Give a detailed story of why you need the assistance around the holidays. This isn’t a guaranteed route to getting a turkey for free but it is worth a try if you’re in need. Churches and social service agencies in the area are also likely to be giving away free turkey to those in need. If your church is not offering this they will likely have contacts of where you may be able to get help. There is no doubt social media has the ability to make a huge impact in the lives of, well, everyone. Putting out a simple request to your friends or followers may result in getting help. There are also a number of Reddit threads for “random acts of kindness.” These may be good places to request a free turkey as well. Lastly, if getting a free turkey sounds like a hassle, you can go to the grocery store and just pick one out. Stay tuned for information on what grocers have the best prices this year! What Will You Find in the Costco November 2018 Coupon Book? Should Retailers Stay Open on Thanksgiving? Update: At a time when offline supermarkets appear to have backed off giving away free turkey, Amazon is debuting this type of promotion for the first time ever. The online mega-retailer is leveraging its acquisition of Whole Foods to try to get more people hooked on Amazon Fresh by offering a free turkey with the purchase of at least $100 in groceries. Plenty of supermarket chains have turkey promotions of their own, albeit with minimum transaction sizes that appear to vary by individual store. Some store locations might not be participating in the promotion or may have run out of the type of turkey promised in the offer — so you probably want to call the stores before assuming the following deals are available. Albertson’s is offering participants in the company’s loyalty program a free Signature Farms turkey of any size with the purchase of $150 in groceriese through Nov 22. Apparently you can’t count alcohol, tobacco, gift cards and guest services toward the minimum transaction size. A circular for ShopRite in White Oak, Maryland says that shoppers can redeem their loyalty points for a free frozen turkey weighing up to 21 pounds. The amount of spending to qualify is $300 — and you have the option of redeeming that bonus for ham, tofurkey or kosher chicken instead and the offer lasts through Nov. 23. The ShopRite circular also touted a series of complicated discounts on the price per pound of fresh turkey — an unspecified minimum purchase lets you pay less per pound than you would without that prerequisite: 50 cents per pound for a ShopRite fresh grade A turkey that’s up to 21 pounds in size, or $1.99 per pound without the minimum purchase; $1 per pound or $2.49 per pound for a fresh Butterball grade A turkey of up to 21 pounds in size. A Fareway supermarket in Des Moines, Iowa is offering a free 14-pound broth basted turkey withe purchase of $50 or more at meat counter — the offer lasts through Nov. 22. Participants in Weis Markets‘ loyalty program could redeem 50 loyalty points — the equivalent of $250 in spending — for a free frozen turkey weighing up to 50 pounds. Earlier this month, Safeway offered a free turkey with a minimum grocery purchase ranging from $100 to $150, depending on location. The offer expired on Nov. 14. Thanksgiving-themed coupons abound, and one subset of these might include discounts on turkey — or even free gift cards you might apply toward turkey. Look for discarded receipts in your shopping cart — printed on the same paper as them are what are called catalina coupons. Or, scan local newspapers’ shopping and food sections for coupons. Although turkey seems to be an exception to the inflation in food prices due to lagging demand, contests offering free turkey as prizes seem to still be around. If you want to score one, search the internet for free turkey contests in your location — and save the search results so you receive notifications year round. Then pay attention to local radio and television commericals that might mention free turkey. Finally, look for turkey giveaways by local businesses hoping to reel in holiday shoppers. Another way to get free turkey: Look on Craigslist, in the community section. There you might find some people who are opening their doors to people who need a place to go on Thanksgiving. Then you could post your own ad in the barter section — or even in the wanted section — and put forward anything you have to trade for turkey. Depending on how you phrase your post, you might get lucky, especially if you’re open to receiving leftovers. You don’t have to get this creative to receive free leftover turkey — assuming, that is, you have friends or family who still invite you over for Thanksgiving or Christmas dinner. If you’re with family and there’s a lot of uneaten turkey left at he end of the evening, you might not even have to ask before you are offered leftovers to take home. Soup kitchens and other charities tend to serve free turkey to the indigent on Thanksgiving and Christmas; if you’re not indigent, you won’t want to wait in the long lines are typically par for the course in these meals. Food banks also give away turkeys during the holiday season, but you might need to already be a recipient of groceries from them or meet other criteria — including applying for the privilege. A much nicer way to approach charities offering turkey to the indigent: Volunteer to help serve. That has a way of instilling a deep sense of gratitude, which is the true spirit of Thanksgiving. Readers, where are you planning to have turkey dinner this year?